Pernot remarks that many discourses, like Isocrates’ Panegyric, belong to a hybrid genre, partly epideictic, partly deliberative. In other words, such texts are basically symbouleutic (from sumboulê: advice) – i.e. the orator supposedly performs a deliberative activity – but they are grounded on an encomiastic matter (from enkômion: praise), so that the orator should also perform an epideictic activity. According to Pernot, this is the typical case in which we can see that praise is a kind of advice. In the following, I would like to develop an approach which helps us to better capture the intuitive link between praise and advice. I will then illustrate my claim by analyzing a short political text. Ancient authors used to distinguis between different notions of “advice” – with a sophistication that we have lost nowadays. The first variety is sumboulê which concerns matters that still have to be deliberated, for example: “We must declare war on the Persians”. The second one, parainêsis, has to do with matters that no citizen is allowed to discuss, since they are regarded as undisputable, for example: “We must honour our gods”. Although this crucial distinction has been aptly described by Pernot, it should be remarked that each type of advice leads the audience to a specific kind of “decision”. Indeed, sumboulê, i.e. the deliberative advice, causes the audience to opt for a certain type of decision, viz. bouleusis. This decision is a rational one, and may be the result of a complex process of personal or collective reflection. On the contrary, parainêsis, i.e. the epideictic advice, leads to another specific kind of decision, viz. proairêsis. This is a kind of decision that does not follow from rational reflection, since it is presented by the orator as obvious and necessary and normally felt so by the audience. In order to clarify this issue, let us consider an example which I owe to Marc Dominicy. If we ask to some person who saved Jewish children during World War II: “Why did you take this decision?”, (s)he will certainly answer that (s)he necessarily acted so, because (s)he thought it impossible to act in another way. Indeed, it would be highly surprising to hear him/her say: “Well, I checked the pro’s and the contra’s and, finally, I took my decision”. This indicates that the decision at hand was (or is presented as) an instance of proairêsis which concerns a matter that is not disputable. Indeed, according to our system of values the deontic principle “We have to save children from death” pertains to parainêsis, i.e. to the kind of advice that cannot be deliberated anymore. Although I agree with Pernot that there is a systematic link between praise and advice, I think he was unable to account for it because he did not see that parainêsis leads to proairêsis and not to bouleusis. Thus, the homonoïa effect can only be got if the discourse provokes some emotion. This confirms Marc Dominicy’s theory, according to which the epideictic genre is a specific instance of the poetical use of language. Indeed, the epideictic argument of amplification is often expressed by utterances which exhibit poetical features of rhythm, rhymes, parallelisms, etc. Dominicy claims that this formal patterning of arguments aims at giving rise to emotion. Unfortunately, I have no time here to develop Dominicy’s theory, but I will keep as a postulate that there is a link between the poetical form of an utterance and its capacity to generate emotion. A second consequence is related to the necessity that is attributed to this type of arguments. Since the matter which the argumentation deals with is not disputable, this leads to a kind of decision that imposes itself to the agent, a kind of decision without deliberation, i.e. a necessary decision. Indeed, if we look at the structure of an epideictic argument, we will see that its Backing – to use Stephen Toulmin’s expression – reduces to the evidence. This entails a crucial consequence: this sort of argument cannot be discussed, because to discuss it amounts to denying the evidence. And it is well known after Aristotle that the one who challenges the evidence will be regarded either as a fool or as a deviant subject. In order to distinguish clearly between both kinds of advices, it is useful to formalize them within Toulmin’s model. 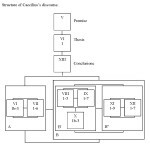 As we can see, the components which correspond to the different parts of the deliberative activity are lacking. The Rebuttal is necessarily empty, since, as I said earlier, this kind of argument is not open to discussion and, therefore, cannot generate any counter-argument. These two argumentative patterns provide us with a formal criterion which establishes that the epideictic advice is parainêsis, namely an advice without deliberation. The Backing is the evidence, it is not embedded, as in the deliberative advice, in a specific field where the orator found the Warrant of the argument. Consequently, the one who challenges the Backing is either fool or deviant. Finally, the emptiness of the Rebuttal component automatically imposes necessity as the Modal qualifier, while a deliberative argument can only assign a certain degree of probability to its conclusion. I shall now illustrate these reflections by analyzing a short political discourse. As a political discourse – it is indeed a propaganda speech – it should normally belong to the deliberative genre. But, as we shall see, it is, on the contrary, a typical case of epideictic discourse. I warn you that you will have pain – when healing and relief depend upon payment. I warn you that you will have ignorance – when talents are untended and wits are wasted, when learning is a privilege and not a right. I warn you that you will be cold – when fuel charges are used as a tax system that the rich don’t notice and the poor cannot afford. I warn you not to be ordinary. First, we have to clarify an important feature of this discourse. As I just said, this is an example of blame. The link we have established between praise and a certain kind of advice (parainêsis) has a symmetrical structure in its negative version, so that we may similarly relate blame to warning. Indeed, warning is the negative version of advice: both are predictions, but advice forecasts some desirable state of affairs, while warning forecasts an undesirable state of affairs. This is the case with Neil Kinnock’s speech: the blame on Margaret Thatcher leads to a specific warning. Let me now analyze some aspects of this discourse. As we can see, the text is (poetically) organized as a litany. Except for the beginning, each utterance exhibits the form “I warn you”, followed by a proposition (first part of the text) or an infinitive (second part). From an illocutionary point of view, this implies that we have a first series of assertive speech acts (I warn you that P): the speaker describes the disaster to come if the initial condition is realized (i.e. “if Margaret Thatcher is re-elected as Prime Minister”). The speech acts of the second series (I warn you (not) to) are directives: the speaker warns the audience not to belong to a certain category if the initial condition is realized. I would like to concentrate on the second type of speech acts because of their deontic character. Indeed, their propositional content should normally describe the state of affairs which the audience is supposed to decide to bring about. Now, if we look at the last four utterances, the state of affairs at hand (“not to be ordinary”, “not to be young”, “not to fall il” and “not to get old”) cannot be brought about by the audience so that it is impossible to decide “not to be ordinary”, “young”, etc. This leads us to a very important point for the analysis of the epideictic aspect of the speech: the orator does not say that the blamed subject (i.e. Margaret Thatcher) is bad, but he shows it by implicating the impossibility of living normally if Thatcher wins. By his absurd warnings, he shows that Thatcher is against nature itself. Therefore, the real warning is not said in the speech, it is suggested through the evocation of a situation that is impossible to bring about. If the audience does not want to be constrained to an absurd requirement, they must refuse the initial condition, by avoiding to vote for Thatcher. First, as I said earlier, the orator of the epideictic discourse may obtain the homonoïa effect that will lead to proairêsis by grounding his argument on the evidence. And, the evidence has not to be said, since it cannot be argued for or against. The evidence has to be showed. Secondly, when blaming, the orator runs a risk that does not exist in the case of praise. Indeed, by incriminating someone publically, the orator runs the risk to look hateful because of his lack of magnanimity. As pointed by Francis Goyet, this is the reason why, the orator who wants to create the homonoïa effect will rather use conciliation than indignation. According to Goyet, the highest emotion is not said, it is showed; this corresponds to what he calls “the silent sublime” (“le sublime silencieux”). Showing is therefore better than saying when one tries to increase the homonoïa effect. Moreover, the orator’s positive ethos is also highlighted because of his appearance of magnanimity. Let us now make some remarks about the argumentative form of this speech. This is a typical case of amplification with many phonological repetitions, syntactic parallelisms and finally, the repetition of “I warn you” that gives a prophetical aspect to the whole speech. As I mentioned before this poetical form of amplification is a major trigger of emotion, and specifically of that particular form of collective emotion, called the homonoïa effect. In conclusion, we can say that the aesthetical component that Aristotle detected in the epideictic genre, relates to amplification and its purpose, viz., homonoïa as a persuasive effect produced by discourse. Nevertheless, it remains that the aim of the epideictic discourses is clearly political: they aim at creating a general disposition to action in the city. This disposotion will favour a particular kind of decision: proairêsis. Aristote (1947). The “Art” of Rhetoric, Cambridge, London: The Loeb Classical Library. Cassin, B. (1995). L’effet sophistique. Paris: Gallimard, Essais. Cassin, B. (1997). Procédures sophistiques pour construire l’évidence. In: C. Lévy & L. Pernot (Eds. ), Dire l’évidence. Paris: L’Harmattan. Dominicy, M. (1993). De Toulmin à Perelman. Analyse d’un réseau argumentatif, Verbum 1-2-3, 241-250. Dominicy, M. (1995). Rhétorique et cognition: vers une théorie du genre épidictique. Logique et Analyse 150-151-152, 1-19. Dominicy, M. (1996). Le genre épidictique: une argumentation sans questionnement? In: C. Hoogaert (Ed.) Argumentation et questionnement. (1-12), Paris: Presses Universitaires de France. Goyet, F. (1996). Le sublime du lieu commun: l’invention de la rhétorique dans l’Antiquité et à la Renaissance. Paris: Champion. Perelman, Ch. & Olbrechts-Tyteca, L. (1988). Traité de l’argumentation. Bruxelles: Editions de l’Université. Pernot, L. (1993). La rhétorique de l’éloge dans le monde gréco-romain. Paris: Institut d’Etudes Augustiniennes. Searle, J. & Vanderveken, D. (1985). Foundations of Illocutionary Logic. Cambridge: Cambridge University Press.